Do you need a ticket to PyCon 2018? I have one ticket (main conference, no tutorials) for Pycon 2018 in Cleveland that I will not be able to use. It is at the the early-bird rate of $350. Please contact me if you are interested in it. I am thinking of using Beets as music library to update a project. The only example of using it this way is in the source code of the Beets command-line interface. That code is well-written but does much more than I need so I decided to create a simple example of using Beets in a 3rd party application. This will create a configuration that keeps the music files in place and does not attempt to autotag them. "a minimal session class for importing that does not change files"
music database to use """
"configure to keep music in place and do not auto-tag"
"""import/reimport music from the list of paths. """return list of items from the music DB that match the given query"""
I hope this helps. Turns out it is easy to use beets in other apps. 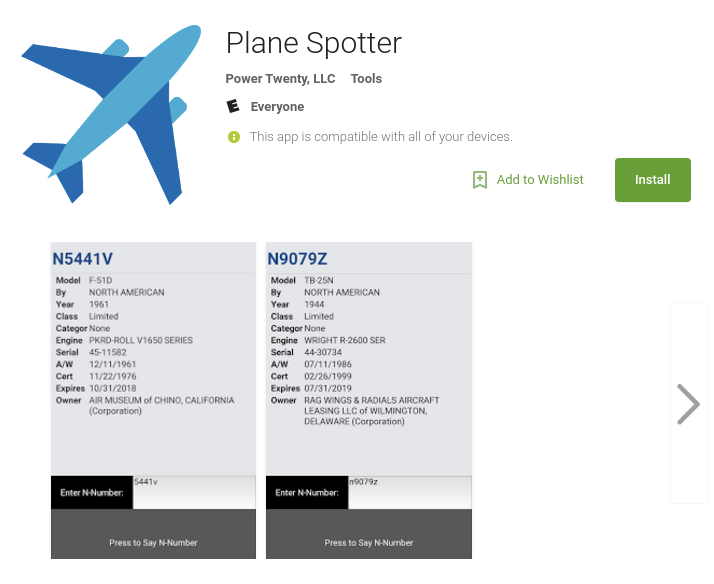 My new app Plane Spotter has been approved. The interesting part of it is that it is written in Python and Kivy. Having written Android apps in Java, Cordova, and now Python, I can unequivocally say that the Python/Kivy combination is the most enjoyable. Once more familiar with Kivy and Python for Android, I predict it will greatly reduce develoment time. The only catch so far is that there is a significant load time when starting the app. Anyway, check it out. There are more options to show the status of files. See the .git-prompt.sh for info. Thanks to Chris Weisel for pointing out a great new font for shells and Vim. I usually check out “great new programming fonts” and am consistently disappointed. This one is different. It is similar to Bitstream Mono, but not as heavy. That makes it more readable for me. I recently open-sourced some of my code. It’s a C++ library that wraps the API and provides an ‘Erg’ class. It currently it builds against an older version of the SDK – version 1.24 – and the current build system requires cygwin. On my list is updating it to the most recent SDK. Row2K has posted the first video of a new web series. This one is called ‘Gut Checks.’ It is a series of short interviews with national-caliber rowers interspersed with some great rowing video. It’s a very well done video. I have no idea where I found this. People don’t argue about editors as much as they used to. This joke was more relevant then. Two guys are sitting in a bar, and get talking. "What's you IQ?" one asks. And the two get chatting and become lifelong friends. Further down the bar, two other guys are comparing IQs. "Gosh, mine's 102. What do you think about the latest Cub's game?" And the two become lifelong friends. Even further down the bar, two other guys are also comparing IQs. "Wow! Mine's 54. Do you use emacs or vi?" I just stumbled on Geert Jansen’s book ‘Thoughts on RESTful API Design.’ Here he has documented things he learned while designing the Red Hat Enterprise Virtualization API. The nice thing is that the source to the book is on github and you can read it on ReadTheDocs.org. It outlines some good design decisions when creating an API and is well worth taking a look. It’s not too long of a read. """group header label1 value1 label2 value2 ...."""
You cannot split the arguments across multiple lines to clean up the mess that is the call to the custom tag. So back to the drawing board. It’s my favorite compromise between brevity and maintainability. Which is also cleaner than the all-in-one tag. It’s not for me, but Skylar Savland on github created a Django Template macros with args and kwargs gist that is another solution to this problem. I’d love to hear ideas that solve this problem in a better way.